Omsk (Russian: Омск ohmsk) is the capital of Omsk Oblast, Siberia, and is a regional hub for Western Siberia and the Altai mountains in Russia, as well as northern Kazakhstan. Founded in 1716 as a fortress on the Imperial Russia's expanding southern frontier, by 1850s Omsk grew to become the capital of Western Siberia and parts of Central Asia. 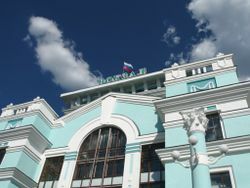 The construction of the Trans-Siberian Railway in the late 1890s brought a rapid development boom, culminating in an extravagant 1910s World Fair, around the time of which Omsk acquired much of its neoclassical architectural heritage. Largely due to its strategic importance as the gateway to Siberia and the Russian Far East, Admiral Kolchak of the anti-Soviet White Army chose Omsk as his base and "capital of Russia" in 1918–1919. Today, Omsk is Russia's seventh largest city with a population of over 1.1 million. An Omsk visit is one of the highlights of a trip to Siberia for the city's attractive and bustling 19th century center, and its numerous cultural opportunities. Literature lovers will find a special interest in Omsk, as it was Dostoevsky's home during the majority of his exile from Saint Petersburg. Omsk Tsentralny Airport (Аэропорт г.Омска) is located 7km south of the city centre. The airport handles approximately 1 million passengers per year. There are regular flights between Omsk and Moscow, Saint Petersburg, Astana, Bishkek, Istanbul, Novosibirsk, Simferopol, and Yekaterinburg. When taxing a taxi from the airport, be sure to negotiate the price in advance and take a legal taxi cab. Better way - use such services like Uber, Yandex Taxi or Gett Taxi with minimal prices. The southern and northern branches of the Trans-Siberian Railway converge at Omsk. Trains arrive from Moscow (40 h) and the Russian Far East (4-5 days) daily. The city center around Lyubinsky prospekt is easily walkable and is best explored on foot. Public transport operates from 6:00AM to 11:00PM and will take you to most places you need to go. Route maps are available online. A ticket for a bus, trolleybus, or tram costs RUB22 and a ride in a marshrutka costs RUB25. Trolley N4 & N7, and buses N50, 60 and 69 are particularly useful. Taxis are plentiful and there are several taxi companies operating in Omsk. The historical part of town is centered on Lyubinsky prospekt, near the confluence of the Om and Irtysh rivers. It is lined with century-old buildings of former merchant salons, residences, and larger commercial, government and religious establishments. The area now has some of the poshest shopping and the best nightlife in the city. Ulica Krasnyh Zor' (aka Nikol'skij prospekt) leads from the Cossacks' cathedral to a few blocks of historical carved-wood houses. This street can give an idea what Omsk and Siberia used to be like for centuries before industrialization. Unfortunately, these houses are not yet protected as cultural heritage landmarks and may eventually be demolished. Omsk is rich in shopping. There is a vast contrast of rich and poor people living in Omsk- which is shown through it's shopping malls. There are shops with extremely cheap goods. On the other hand, there are modern shopping malls where every shop is completely expensive, for example, a simple shirt would be £100 and a handbag would be £200; Nevertheless, Omsk offers great shops with lots of goods to offer. American chains including McDonald’s, KFC, Subway, Friday's, and Sbarro have locations in Omsk. Millenium, bagnuka 7a, Very out of the way hostel in the far west of the city. Very nice and clean. Dorms for 350r. Reached by bus 82 or microbus 470, 374, 371, 409, 362, 343, or 389 from the cathedral in the main city square. Taxi from the train station should not cost more than 270. Omsk is a convenient hub for several regional attractions. Distances are large and locals will consider a city 700km away to be 'nearby'. However, trains are reliable. Tobolsk and Tomsk are the oldest cities of Siberia. 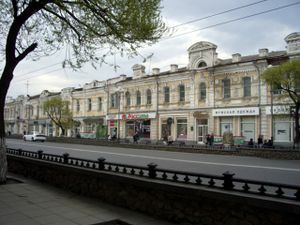 Because the main transportation arteries originally bypassed them, the towns stayed small, avoiding the typical Soviet development, and retaining their unique picturesque characters. They are reachable by overnight train, or, in the case of Tobolsk, by speed jet boat along the Irtysh River (10-12 hours). Irregular boats also operate to Khanty-Mansiysk and Salekhard, within the Arctic Circle. This is the best way to see the West Siberian terrain, grand rivers, and rural lifestyle. For some towns, this boat is the only access to the outside world. Barnaul (16 hours by train or a 1.5 hour flight) is the gateway to the Altai mountains and national parks. Kazakhstan is accessible by train - Petropavlovsk (4 hours), Astana (12 hours), or bus - Pavlodar (8 hours). This page was last edited on 3 February 2018, at 16:44.